"Gyasi's characters are so fully realized, so elegantly carved--very often I found myself longing to hear more. Craft is essential given the task Gyasi sets for herself--drawing not just a lineage of two sisters, but two related peoples. Gyasi is deeply concerned with the sin of selling humans on Africans, not Europeans. But she does not scold. She does not excuse. And she does not romanticize. The black Americans she follows are not overly virtuous victims. Sin comes in all forms, from selling people to abandoning children. I think I needed to read a book like this to remember what is possible. I think I needed to remember what happens when you pair a gifted literary mind to an epic task. Homegoing is an inspiration." "Homegoing is a remarkable feat--a novel at once epic and intimate, capturing the moral weight of history as it bears down on individual struggles, hopes, and fears. A tremendous debut." "I could not put this book down"
"It is hard to overstate how much I LOVE this book"
"The hypnotic debut novel by Yaa Gyasi, a stirringly gifted writer . . . magical . . . the great, aching gift of the novel is that it offers, in its own way, the very thing that enslavement denied its descendants: the possibility of imagining the connection between the broken threads of their origins." 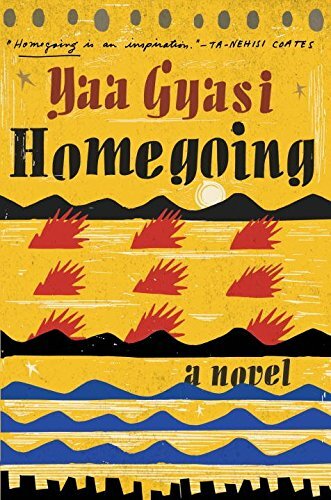 "It's impossible not to admire the ambition and scope of "Homegoing," and thanks to Ms. Gyasi's instinctive storytelling gifts, the book leaves the reader with a visceral understanding of both the savage realities of slavery and the emotional damage that is handed down, over the centuries, from mothers to daughters, fathers to sons. At its best, the novel makes us experience the horrors of slavery on an intimate, personal level; by its conclusion, the characters' tales of loss and resilience have acquired an inexorable and cumulative emotional weight." "The brilliance of this structure, in which we know more than the characters do about the fate of their parents and children, pays homage to the vast scope of slavery without losing sight of its private devastation . . . . [Toni Morrison's] influence is palpable in Gyasi's historicity and lyricism; she shares Morrison's uncanny ability to crystalize, in a single event, slavery's moral and emotional fallout. What is uniquely Gyasi's is her ability to connect it so explicitly to the present day: No novel has better illustrated the way in which racism became institutionalized in this country." "Toni Morrison's masterpiece, "Beloved," seared into our imagination the grotesque distortions of antebellum life. And now, Yaa Gyasi's rich debut novel, "Homegoing," confronts us of the involvement of Africans in the enslavement of their own people . . . the speed with which Gyasi sweeps across the decades isn't confusing so much as dazzling, creating a kind of time-elapsed photo of black lives in America and in the motherland . . . haunting . . . Gyasi has developed a style agile enough to reflect the remarkable range of her first novel. As she moves across the centuries, from old and new Ghana and to pre-Civil War Alabama and modern-day Palo Alto, her prose modulates subtly according to time and setting: The 18th-century chapters resonate with the tones of legend, while the contemporary chapters shine with clear-eyed realism. And somehow all this takes place in the miraculous efficiency of just 300 pages . . . truly captivating." "Gyasi echoes [James] Baldwin's understanding of a common culture marked by both yearning and pain, in which black people can confront each other across differences and reach a political understanding about what unites them. What distinguishes Gyasi's presentation of this idea is its scope: She does not present us with a single moment, but rather delivers a multigenerational saga in which two branches of a family, separated by slavery and time, emerge from the murk of history in a romantic embrace . . . . . HOMEGOING is a reminder of the tenacity of fathers and mothers who struggle to keep their kin alive. The novel succeeds when it retrieves individual lives from the oblivion mandated by racism and spins the story of the family's struggle to survive." "Rich, epic . . . . Each chapter is tightly plotted, and there are suspenseful, even spectacular climaxes." "A memorable epic of changing families and changing nations." "The arrival of a major new voice in American literature"
"Tremendous...spectacular...[HOMEGOING is] essential reading from a young writer whose stellar instincts, sturdy craftsmanship and penetrating wisdom seem likely to continue apace -- much to our good fortune as readers." "A blazing success . . . . The sum of Homegoing's parts is remarkable, a panoramic portrait of the slave trade and its reverberations, told through the travails of one family that carries the scars of that legacy . . . . Gyasi's characters may be fictional, but their stories are representative of a range of experience that is all too real and difficult to uncover. Terrible things happen to them; they're constantly cleaved apart, and in the process, cut off from their own stories. In her ambitious and sweeping novel, Gyasi has made these lost stories a little more visible." "The most powerful debut novel of 2016 . . . . Carrying on in the tradition of her foremothers--like Toni Morrison, Edwidge Danticat, Assia Djebar and Bessie Head--Gyasi has created a marvelous work of fiction that both embraces and re-writes history." "Heart-wrenching . . . . Gyasi's unsentimental prose, her vibrant characters and her rich settings keep the pages turning no matter how mournful the plot . . . . The horror of being present at the wrong place and the wrong time, whether black or white, is handled poignantly . . . . The chapters change narrators effortlessly and smoothly transition between time periods . . . . I kept expecting a Henry Louis Gates 'Find Your Roots' TV show . . . . Yaa Gyasi's assured Homegoing is a panorama of splendid faces." "A remarkable achievement, marking the arrival of a powerful new voice in fiction." "Gyasi's lyrical, devastating debut more than deserves to be held in its own light.... Gyasi traces black history from the Middle Passage to the Great Migration and beyond, bringing every Asante village, cotton plantation, and coal mine into vivid focus. The rhythm of her streamlined sentences is clipped and clean, with brilliant bursts of primary color...the luminous beauty of Gyasi's unforgettable telling. A-"
"Gyasi is a deeply empathetic writer, and each of the novel's 14 chapters is a savvy character portrait that reveals the impact of racism from multiple perspectives . . . . A promising debut that's awake to emotional, political, and cultural tensions across time and continents." "Homegoing is an epic novel in every sense of the word -- spanning three centuries, Homegoing is a sweeping account of two half-sisters in 18th-century Ghana and the lives of their many generations of descendants in America. A stunning, unforgettable account of family, history, and racism, Homegoing is an ambitious work that lives up to the hype." "Stunning . . . . [HOMEGOING] may just be one of the richest, most rewarding reads of 2016." --Meredith Turits, ELLE Magazine's "19 Summer Books That Everyone Will Be Talking About"
"Gyasi gives voice, and an empathetic ear, to the ensuing seven generations of flawed and deeply human descendants, creating a patchwork mastery of historical fiction." "[A] commanding debut . . . will stay with you long after you've finished reading. When people talk about all the things fiction can teach its readers, they're talking about books like this." "Striking... With racial inequality at the forefront of America's consciousness, Homegoing is a reminder of slavery's rippling repercussions, not only in America, Gyasi points out, but around the world." "An important, riveting page-turner filled with beautiful prose, Homegoing shoots for the moon and lands right on it." "Epic . . . The destinies of Effia Otcher and Esi Asare in Yaa Gyasi's spellbinding Homegoing recall those of sisters Celie and Nettie in Alice Walker's The Color Purple, switched-at-birth infants Saleem and Shiva in Salman Rushdie's Midnight's Children and compatriot clones Sydney Carton and Charles Darnay in Charles Dickens' A Tale of Two Cities. Gyasi's debut novel effortlessly earns its spot alongside these distinguished classics . . . . The author's penetrating prose draws intimate and deeply cultivated connections between rival tribes, languages lost and found, real love and a hardness of spirit. And in the process, Gyasi has written a nuanced, scintillating investigation into the myriad intricacies and institutions that shape a family." "Impressive . . . intricate in plot and scope . . . . Homegoing serves as a modern-day reconstruction of lost and untold narratives -- and a desire to move forward." "No debate at all: Yaa Gyasi's Homegoing is impressive, impassioned, and utterly original . . . a story so personalized, so urgent and timely, especially for today's readers and the many who do not seem to understand why African Americans are so conflicted." "Epic . . . a timely, riveting portrayal of the global African Diaspora--and the aftereffects that linger on to this day." "One of the most anticipated books of this summer is from debut novelist Yaa Gyasi, and all it will take to convince you the hype is worth it is reading some of these powerful Homegoing quotes about family, identity, and history. An emotional, beautiful, and remarkable book, Homegoing should definitely be on your summer reading list . . . . With characters you won't be able to forget, and stories that will haunt you long after you turn the last page, Homegoing is stunning -- a truly heartbreaking work of literary genius. It honestly and elegantly tries to unravel the complicated history of not only a family through the generations, but a nation through the years of outside conflict, inner turmoil, and one of the darker pieces of the past." Effia and Esi: two sisters with two very different destinies. One sold into slavery; one a slave trader's wife. The consequences of their fate reverberate through the generations that follow: from the Gold Coast of Africa to the plantations of Mississippi; from the missionary schools of Ghana to the dive bars of Harlem. Spanning continents and generations, Yaa Gyasi has written a miraculous novel - an intense, heartbreaking story of one family and through their lives, the story of America itself.